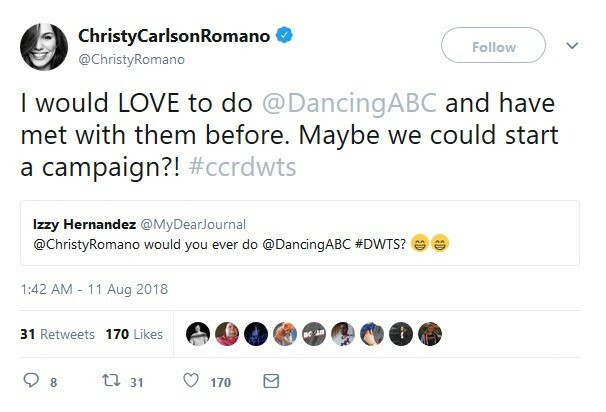 9 responses to "PureDWTS Season 27 Cast Rumors & Watchout: Christy Carlson Romano “Would Love To Do DWTS”"
I read that they aren’t going to have athletes this season (it was on Good Housekeeping’s website). As for Christy, I’d love her to be on. I think she is one that could definitely surprise and go further than expected. I’d like her to be with Artem or Alan. I feel like now would be a great season for her to do as well since they are making the Kim possible live action. Which I believe she is going to be in. I love the nostalgia comebacks of late (Fuller House, One Day at a Time, Murphy Brown (aka my favorite sitcom of all time), and apparantly Alf is coming back (this made me very very happy lol) but her being back on tv would be amazing for me. She is hysterical on Even Stevens and always seemed like a celeb that is just a nice person….which I like. I’d say Alan as well but maybe Keo too. I would love seeing Christy on DWTS, she seems so sweet, and honestly I am pretty optimistic about her chances of being cast this season. @Court good to know! Yeah, I’d find it hard to believe there wouldn’t be at least one athlete included. And while I understand why they go for the figure skaters, gymnasts, and football players, I’d love to see more athletes whose sports haven’t been well represented (if at all)on the show. Really excited to see who will be cast this season! I would love to see Christy do DWTS, Kim Possible was one of my favorite shows as a kid. Also, I could actually see her being asked since the live action Kim Possible is coming out next year and Christy is going to play a part in it, possibly some good cross-promotion for Disney. If there are any athletes this season i wouldn’t be surprised to see the Shib sibs on. Since they are on a break from skating and as I don’t believe they have had a brother sister pair compete against each other on DWTS this would be a get for the producers. The only reason they wouldn’t is the spring season was figure skater heavy. I just have a feel they could be a likely choice unless they don’t want to do it. I know the figure skater thing is over done but I love these two and wouldn’t mind seeing them on. They also have a pretty big following because of their YouTube channel.